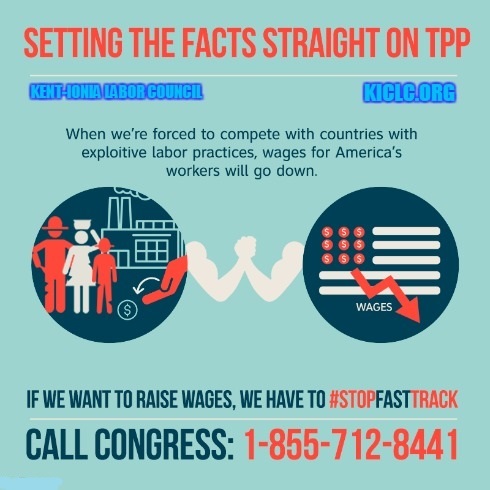 GRAND RAPIDS June 4, 2015– Yesterday, millions of people across the United States made calls and sent emails to their Congressperson to let them know that Fast Track trade deals just don’t work for the middle class. Phone lines at the Capitol were lit up all day as working men and women let Congress know that we do not want and cannot afford another bad trade deal, and that we deserve trade policy that works for everyone– not just the top 1%. Here in west Michigan, members of the Kent-Ionia Labor community were urged to reach out to the two members of Congress that represent Kent and Ionia Counties– Rep. Bill Huizenga and Rep. Justin Amash. Last month, Rep. Amash told union members at a town hall meeting that he was still on the fence about the Fast Track bill, which makes it all the more important to let him know how we feel about this legislation. Dozens of organizations, including labor unions (CWA, Teamsters, the Machinists, BCTGM, the AFL-CIO), environmental groups (Sierra Club), farming associations (FarmAid, Family Farm Defenders, Organic Consumers Association), civil rights groups (Jewish Voice for Peace, SOA Watch, Code Pink, ACLU) and even corporations (Ben & Jerry’s) joined together to urge their members and supporters to call Congress and stop this undemocratic and anti-worker trade bill. But just because the national call-in day is over, that doesn’t mean we can let up. We still need to let our Representatives know that fast tracking the TPP will be even worse for American jobs than NAFTA was 20 years ago. Call 855-712-8441 to be connected to your Congressperson’s office. Or click here to send your representative an email. This entry was posted on June 3, 2015 by WMALC in Events and tagged Democrats, Republicans, trade.